Hot glue guns can be invaluable to crafters and homeowners alike. 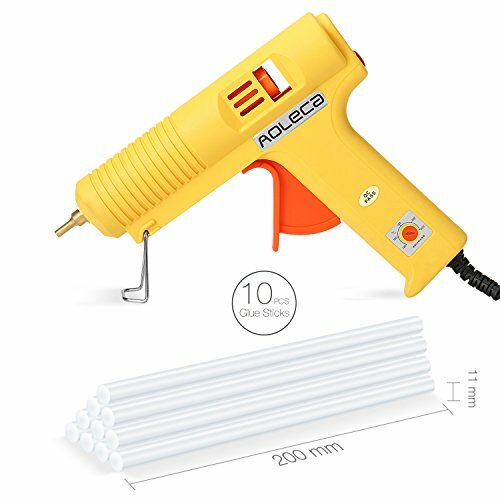 From small mini hot glue guns used to add delicate beading to large industrial models that work on wood and metals for heavy-duty projects, there is a hot glue gun for every purpose. Our ReviewLab team did extensive research into the features that add the most value to users. For each of our selections, we’ve provided information about the key considerations such as temperature range, trigger and tip design, and more. Read more about our methodology. 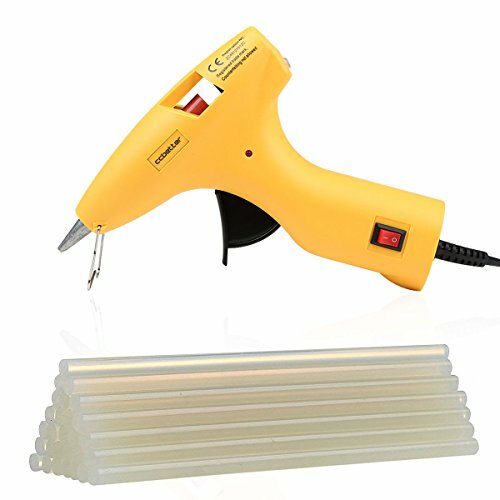 This hot glue gun has the right combination of fast heating, anti-drip design, and extra features to make it a standout on performance and quality. 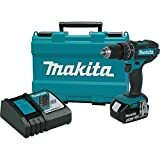 The adjustable temperature gives excellent options for both delicate materials and tough to bond wood and plastics with its max temp of 428 degrees Fahrenheit. With two temperature settings, a multi-finger trigger, and smooth application of glue, this hot glue gun works well for a variety of projects. A well-designed handle makes it a user favorite that won’t disappoint. Small and portable, this little glue gun packs a powerful punch in a small package. It dispenses with a smooth stream and heats in roughly five minutes. If you’re on a budget and you don’t need any extra features, this glue gun can get the job done. This is a compact hot glue gun that has an on/off switch and a fine tip nozzle for that reaches into small cracks and crevices. It also comes with a removable stand that works well to keep the glue gun upright. This hot glue gun quickly heats to temperature and includes an overvoltage protection fuse to help control leaks. While it’s a size bigger than a mini gun, it’s still compact enough to fit nicely in the hand. A high temp hot glue gun with a compact design that makes it perfect for crafting. With an on/off switch and indicator light, you can easily tell when it’s plugged in and ready to go. It reaches temperature fast so you can get started right away. 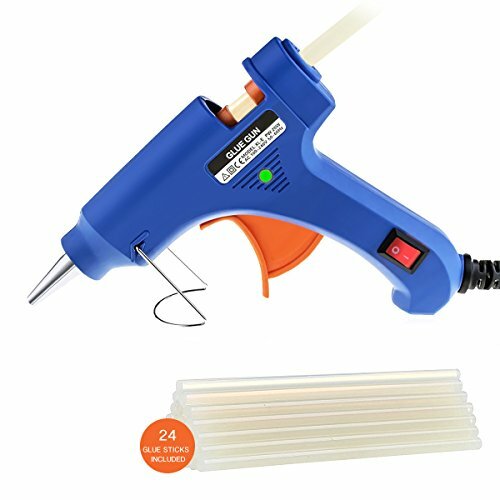 The quickest to reach temperature, only 30 seconds, this dual temp hot glue gun offers excellent versatility. It holds larger glue sticks enabling it to take on big jobs around the home whether they need low or high temps. 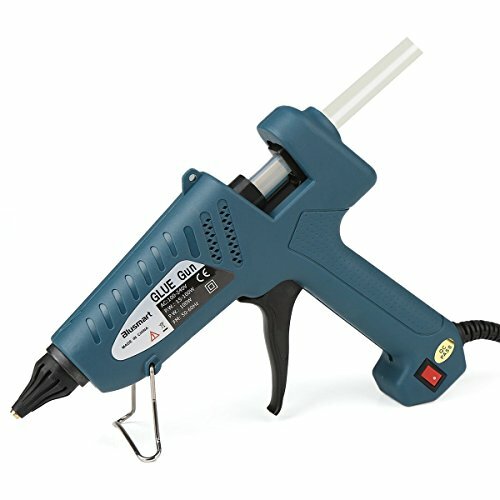 This powerful industrial hot glue gun has a multi-finger trigger, holds large glue sticks, and has an on/off switch. It heats fast and includes a collapsible stand that can be folded down when you need to reach into tight spaces. The temperature range of the hot glue will directly affect the kind of materials and projects on which it can be used. Temperatures below 250 degrees Fahrenheit are considered low temperature and will require glue sticks specifically intended for use in that temperature range. These low temp models work well for delicate materials such as thin plastic, Styrofoam, and some fabrics. Any gun that can reach a temperature over 300 degrees is considered a high-temperature gun. They can be used on a wide variety of materials and products, making them extremely versatile. The trigger on a high temp hot glue gun is usually easier to squeeze because the glue comes out easier at higher temperatures. Dual temp guns can be adjusted to either a low or high temperature. The nozzle size you need will depend on the kind of projects you intend to do. For general use, a standard tip works well. A fine tip works best for detail work like making jewelry or working with small beads. Some models come with multiple tips that can be interchanged depending on the project. You can also separately purchase silicon tip covers to prevent burns. Trigger design plays a more important role than you might think in the functionality of a hot glue gun. 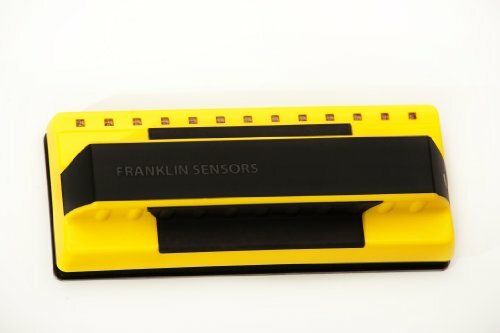 Single finger trigger design works best on high-temperature hot glue guns, but be aware that you’re more likely to get hand fatigue with a single finger trigger. Two or three-finger trigger design reduces fatigue and can help relieve symptoms of carpal tunnel syndrome. Some extras aren’t necessary, but they sure can make using a hot glue gun easier. An on/off switch eliminates the need to unplug the hot glue gun every time you leave your project. It’s a nice feature for those who frequently start and stop their work. Another convenient feature is a power indicator light. These lights, usually located on the back of the handle let you know when the hot glue gun is heated and ready to go. Any hot glue gun that comes with extra glue sticks is always a good idea. You’ll go through glue faster than you think. For less than $10, you can find an inexpensive mini hot glue gun. They can be low or high temp, but they usually work pretty well for small crafts projects and occasional use. You might have to put up with some dripping and clumping. 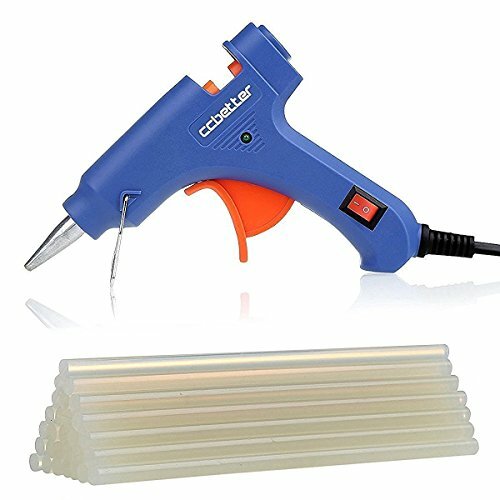 At $10-$20, you can get a decent mini, full-size or dual temp hot glue gun with extra glue sticks. You’ll see some hot glue guns with multi-finger triggers and on/off switches. From $20-$40 are full-size hot glue guns that come with a complete kit, which usually includes extra glue sticks and carrying case. 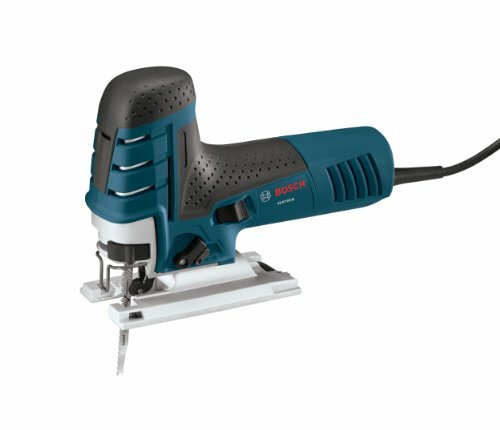 At over $40 are industrial guns with increasing glue capacities and temperatures. 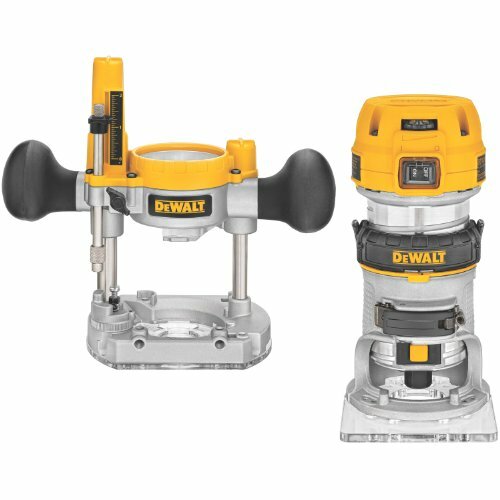 Many budget friendly industrial models work extremely well and offer the volume needed for tougher projects. It should be noted that the price for industrial guns can go well above $200 but these are usually used for manufacturing or construction purposes. The standout features of this hot glue start with an impressive 100W of power that gets the glue gun to temperature in a hurry. As soon as it’s plugged in, the on/off indicator light keeps users up to date on its power status. With impressive anti-drip technology, the fine tip nozzle holds glue inside until the trigger is pulled. The nozzle can be unscrewed and replaced with another nozzle if need something wider. With a temperature range of 212-428 degrees Fahrenheit, this is a versatile tool for low or high temp projects. 100W of power makes for fast heat times. Once you select your desired temperature, there is little wait time for the gun to reach temperature. Many users appreciated how quickly they could get started once the hot glue gun was set and plugged in. Interchangeable anti-drip nozzle. The included anti-drip technology works well with the narrow nozzle. Drips are one of the number one complaints about hot glue guns, and this one keeps glue under control. The nozzle can also be unscrewed and replaced with a wide tip if necessary. Wide temperature range for both delicate and tough materials. 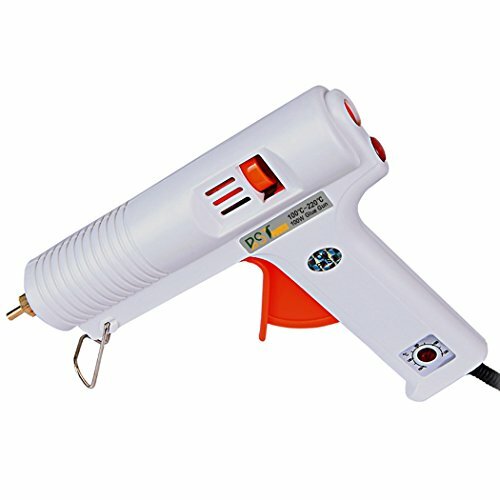 This hot glue gun offers an excellent temperature range for use on a wide variety of materials. Many users replaced separate high and low temp guns with this one model. Highly-visible on/off indicator light. The on/off indicator light, located on the back of the handle, makes the power status clearly visible. Users who multi-tasks and do multi-step projects appreciated the extra safety feature the light offered. Need to use a screwdriver or nail to adjust the temperature. The temperature adjustment dial requires a screwdriver or use of your fingernail to move the dial. This handy hot glue gun comes in at a close second for best overall. It has an excellent, lightweight design that doesn’t sacrifice quality. The three-finger trigger works well for those with carpal tunnel or other medical conditions. When working on a long-term project, the on/off indicator light on the back of the handle is easy to keep track of power. A built-in kickstand holds the gun steady while not in use, preventing it from falling on its side where it could be vulnerable to leaks. The two temperature options, either 60W or 100W, are reached within 5 minutes of startup. On/off indicator light for quick checks on the power. The power indicator light lets you know if it’s plugged in without having to check the cord. Users who did all-day projects appreciated that they could check power with a glance. Handle and three-finger trigger design reduces fatigue. This glue gun is lightweight, fits well in the hand and has a three-finger trigger that reduces fatigue. Many users liked that the pressure was spread over multiple fingers. Stable kickstand offers a sturdy rest. The built-in kickstand is sturdy enough that the glue gun won’t tip over, preventing drips. Heating to temperature in 3-5 minutes. It reaches temperature in as little as three minutes. Two temperature options. The temperature options are based on the power making the low temp option 60W and the high temp option 100W. Dripping while hot. Some users found that it dripped while on the high temp setting. If you’re a crafter on a budget, this mini hot glue gun offers the basics in a portable package. 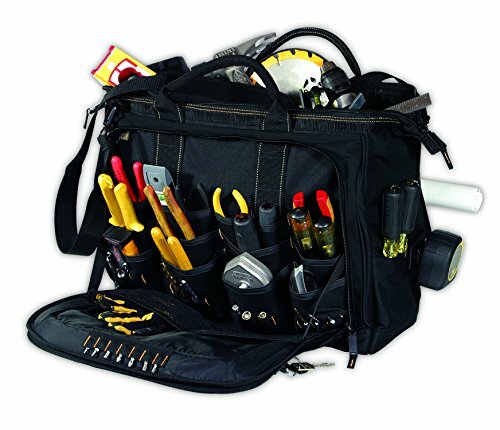 The compact, lightweight design not only allows for easy storage but also makes it easy to hold and use. One of the few extra features is the on/off switch located on the handle. The switch lets you control the power without having to reach down to unplug the glue gun. For such a small gun, it includes a long cord that gives you a good range of use. This helps keep you from getting caught in a short cord or stuck in a small area to work. Compact, lightweight design. This mini glue gun makes storage simple. It’s small size also allows it to fit nicely in the hand. On/off switch for better control. An on/off switch on the handle lets you control the power without having to unplug the cord. Long cord for better range of use. Though the glue gun is small, many users found the cord is long enough for a good range of use without an extension cord. Built-in kickstand gets in the way. The built-in kickstand, which doesn’t work particularly well, gets in the way of doing fine detail work, especially in tight spaces. This compact model is another mini hot glue gun that works well and fits just about anywhere. It’s size and weight help keep hands from getting fatigued. A favorite feature is the light-up on/off switch on the handle. That not only gives you control over the power without having to unplug it but also provides a visual indicator of the power status. Another nice feature is the removable stand. It holds the gun stable while not in use so you don’t have to lay it on its side. Best of all, the stand is removable for when you need to reach into tight spaces. Easy to use compact size. The compact size and design don’t take up much storage space and make it lightweight, reducing hand fatigue. Convenience of the on/off switch. An on/off switch, located on the handle, allows you to shut the glue gun off without having to unplug it. Many users like having this extra feature as it gives them more control over their workspace. Removable stand holds the glue gun stable. The stand holds the glue gun stable when not in use. However, it can also be removed which several users reported helped it to easily fit in tight spaces. Stand gets stuck behind trigger. A few users reported that the stand, when placed flush with the hot glue gun, got stuck behind the trigger. They then had to pull the trigger to remove it. Low-temperature hot glue guns usually run between 170 – 250 degrees Fahrenheit. Low temp guns are meant for delicate materials like Styrofoam, flimsy fabrics and thin plastics. Glue sticks used in this type of gun are specifically made to have a low melt point. This type doesn’t work on a wide variety of items, but if you do work with delicate materials often or if you plan to let children use a hot glue gun, a low temp model is a good option. Keep in mind, you can still get a painful burn from the glue or tip of the gun so caution and close supervision are a must. 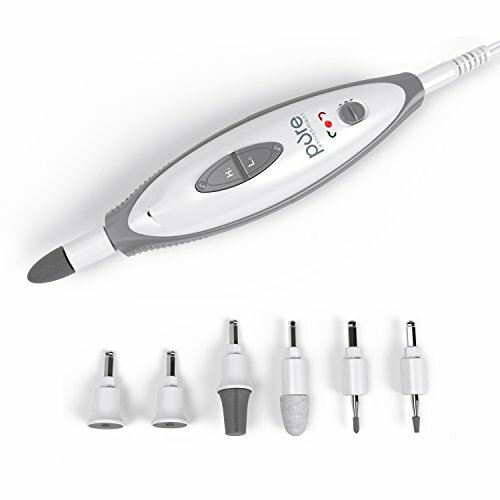 The fine tip nozzle makes this low temp model ideal for detail work on delicate materials. There’s no waiting around when it comes to using this model. It quickly heats to temperature in as little as three minutes. With its compact size, it fits well into the hand without being heavy or awkward to use. A lightweight glue gun like this also reduces user fatigue, especially when working on all-day projects. User fatigue is further reduced with the three-finger trigger, which works well for those with carpal tunnel. Quickly heats to temperature. 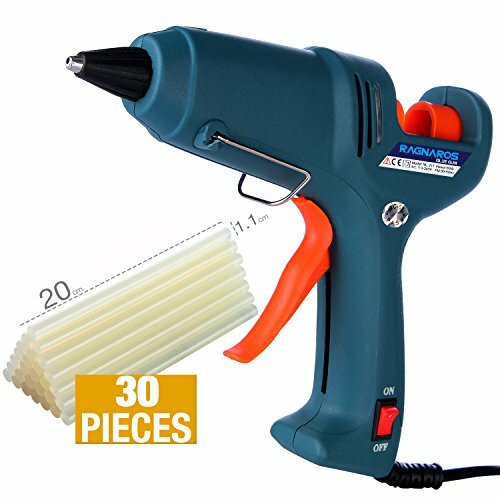 The 60W of power get this glue gun heated to temperature in 3-5 minutes. Most users appreciated that they didn’t have to wait around to start their projects. Compact size fits well in the hand. While not a mini gun, the size is still compact enough to fit well in the hand. Users reported that its lightweight also added to its ease of use. Three-finger trigger is easy to pull. An easy to pull three-finger trigger helps to reduce hand fatigue. The trigger works well for those with carpal tunnel or who have weak hands. Position of the on/off switch. While the on/off switch is a nice feature, on this glue gun the positioning makes it easy to turn off the glue gun while pulling the trigger. High-temperature hot glue guns run anywhere from 300 – 500 degrees Fahrenheit. For most purposes, a hot temp hot glue gun will do the trick. These guns heat fast, and the glue comes out smooth. They work on a wider variety of materials than low temp guns. For those with carpal tunnel or low hand strength and flexibility, a high temp hot glue gun is a good choice because the glue comes out easier than with low temp models. However, you can get more severe burns with this type of hot glue gun. This high temp hot glue gun gets to temperature in no time. Once there, it melts glue so that it smoothly comes out of the nozzle. 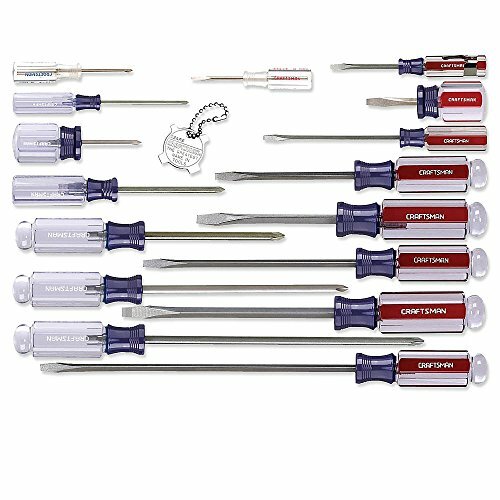 The fine tip is perfect for detail work while the high temp can be used on wood, metal and other tough materials. It comes in a compact size that’s easy to store yet the build is sturdy enough to fit nicely in the hand. A two-finger trigger pull helps to reduce user fatigue. The on/off switch and power indicator light are extra features that provide more control when gluing. With a glance, you can tell if the glue gun is still on and ready to go. Quickly reaches temperature. With 30W, it’s able to quickly get to temperature. Many users like that they don’t have to wait around for the glue to be ready to go. Compact size with a sturdy feel. It’s compact enough for easy storage but has a solid construction that fits nicely in the hand. Fine tip for detail work. The fine tip and high temperature let you do detail work with glue that comes out smooth. On/off switch with indicator light. An on/off switch gives you better control, and the indicator light means you don’t have to check the cord before you begin. Small size is inconvenient for large projects. This glue gun takes mid-sized glue sticks that are best for crafting projects. 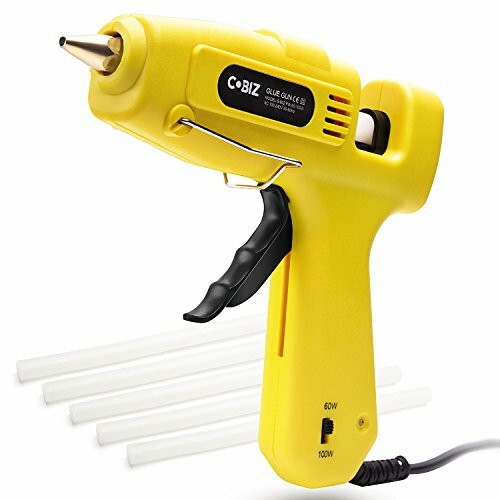 If you have larger projects around the home that need a high temp glue gun, this one will go through a lot of glue sticks. Dual, sometimes called adjustable temperature, temperature hot glue guns have a dial or switch that allows you to change the melting point of the glue anywhere from 170 – 428 degrees Fahrenheit or higher. These all-purpose hot glue guns can handle delicate materials as well as wood, metal and heavy plastics. For those who don’t have room for a separate low temp and high temp hot glue gun, it’s hard to beat the practicality of a dual temp gun. You’ll need glue sticks appropriate for the temperature at which you’re working, but other than that, this type of gun is a definite space saver. This well-made dual temp hot glue gun has enough power, 100W, to work well at high and low temperatures. It reaches temperature in less than a minute, letting you get to work without delay. An indicator light on the back of the gun lets you know when it’s plugged in so you’ll always know when it’s ready to go. Not only does it provide a smooth, steady stream of glue, it holds large glue sticks which is perfect for big projects. Quick to reach temperature. While we consider most hot glue guns quick to heat when they reach temperature within 3-5 minutes, this model reaches temperature in less than a minute thanks to its 100W of power. Holds large glue sticks for a greater volume of glue. Big glue jobs around the home are a cinch with the large glue sticks this glue gun holds. Many users liked that they didn’t have to stop and replace glue sticks mid-project. Excellent temperature range for versatility. The minimum temperature is low enough, 212 degrees Fahrenheit, for delicate materials and the high of 428 degrees Fahrenheit can handle wood, metal and other tough materials. Smooth steady stream of glue. Users report one of their favorite features is the smooth, steady stream of glue that comes out once the glue gun reaches temperature. Globs and strings are kept to a minimum. Wide tip doesn’t work well for detail work. The tip isn't intended for detail work. Because it's wide, more glue comes out than is needed for small jobs. Industrial hot glue guns come in a wide variety of sizes and capacities that can handle larger glue sticks, usually 1/2-inch to 5/8-inch diameter, to put out a higher volume of glue per hour. They can come in high temperature or dual temperature models. This type usually has short warmup times and ergonomic trigger design. If you are a serious crafter or want to use hot glue for big jobs around the house, an industrial hot glue might be the right choice for you. Because of the volume of glue they dispense, they may not work well for fine detail work. 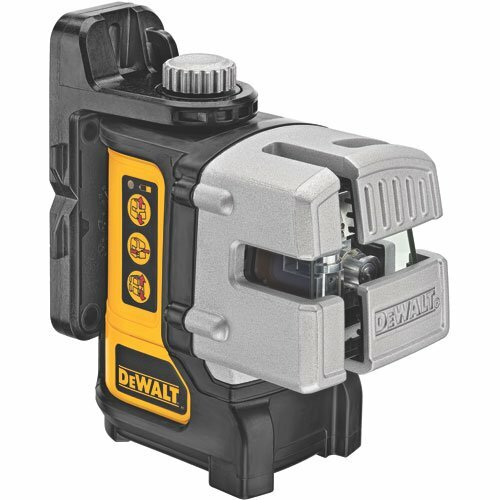 With 100W of power, this industrial glue gun does its job without a moment of hesitation. It heats quickly so there’s no waiting around. It can handle the large, thick glue sticks often needed for big projects. It gets the glue hot enough to come out in a smooth stream. On the handle, there is an on/off switch that lets you pause a project and easily turn the glue gun back on when you’re ready to go. This gives you better control and the option to leave your work area with it still set up and ready to go. A sturdy, collapsible stand works extremely well for holding the gun above the work surface while it heats or when it’s resting between uses. Uses large glue sticks for big projects. This glue gun holds large glue sticks that work best for big projects. Many users like that they don’t have to stop mid-project to refill the glue gun. On/off switch when you need to pause a project. The on/off switch, located at the bottom of the handle, lets you pause your project without unplugging the glue gun. Collapsible stand for easy heating and resting. The stand can be folded out when you need to let the gun heat or rest while you work on your project. It’s sturdy enough to keep the glue gun in place. Dribbling and a few trigger problems. A few users reported that their glue gun dribbled and that the trigger mechanism didn’t grab the glue stick to press out glue.